The Journal of International Political Anthropology provides a new and much-needed forum for interdisciplinary and comparative scholarship, addressing problematics and concerns of the contemporary political scene through the prism of anthropologically based approaches. Last Issue: Vol. 11, No. 2 - For 50 days only! 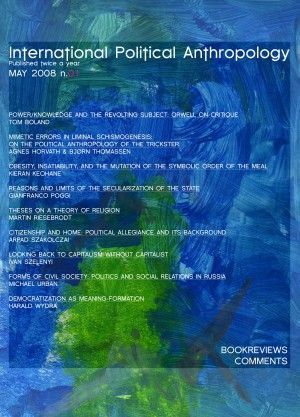 A MAIN AIM OF THE JOURNAL IS TO GIVE A VOICE TO CONCEPTUAL AND METHODOLOGICAL CREATIVITY, LINKING THE STUDY OF POLITICS TO PERSPECTIVES AND TOOLS DRAWN FROM DISCIPLINES OR SUBJECT AREAS THAT HAVE BEEN LONG CONSIDERED IRRELEVANT TO THE STUDY OF POLITICS PROPER. WE, THEREFORE, INVITE CONTRIBUTIONS THAT LINK CONTEMPORARY PROBLEMS OF POLITICS TO A COMPARATIVE ANALYSIS OF CIVILIZATIONS, MYTHOLOGY, ARCHAEOLOGY, HISTORY OF THE LONGUE DURÉE, RELIGION, SYMBOLISM, VIOLENCE, OR POLITICAL SPIRITUALITY. WE ARE INTERESTED IN CONTRIBUTIONS THAT THEMATIZE THE PRE-POLITICAL LINKS BETWEEN HUMAN BEINGS AND AUTHORITY AND THAT CONNECT THE ANALYSIS OF HISTORICAL CRISES WITH THE INTERPRETATION OF MEANING AS A CENTRAL ASPECT OF THE FORMATION OF LEADERS, POLITICAL CONSCIOUSNESS, OR SOCIAL COHESION. BOOK REVIEWS, REVIEW ARTICLES, and COMMENTS TO THE JOURNAL. Open Access: all articles are available on the internet to all users immediately upon publication for a limited period.